The ACBMs are only the storage locations for this proposed module and is not the deployment location, which would be below cupola and unity with the arm pointing nadir and payloads could be deployed in almost any degree of downward direction that does not deploy towards the RS. Firstly, the actual PVGF cover itself would need to be removed. If it is true that this cover is attached via a PCBM collar, then the ACBM bolts on Node 3 Zenith would need to be driven in order to remove the cover. However, I don't know whether the four CPAs that would be needed to control the driving of the bolts are present, meaning the cover would first have to be cut open, and the four CPAs installed via EVA - which would be very difficult, as they require manual connections to be made which would be very fiddly to perform while wearing EMU gloves. Once the cover is removed and any PVGF electrical connections were demated, the eight CBM alignment guides would need to be installed, with each one needing eight separate bolts to be driven, making for 64 bolts in total (although perhaps a reduced number of bolts would be acceptable, so this number could possibly be lower). In any case these bolts were not designed to be driven via EVA, and would be difficult to install. Only then, assuming all the other relevant hardware was present on the Node 3 Zenith CBM (such as the hooks), would it be possible to berth a module to Node 3 Zenith. All in all, it would likely be more trouble that it's worth, so I doubt we'll ever see it happen. 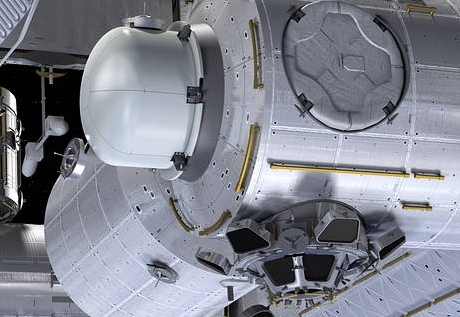 If ISS really needs more ports, a better idea would be to allow industry to design their own module, with it's own internal, external, and airlock/deployer facilities, and possibly even separate power/ECLSS capabilities to cut down integration with ISS. Put it on Node 2 Forward (with PMA-2 moved to the forward end of the new commercial module). I suspect you think the chances of this are low, but if it did go ahead, why node 2 FWD? Node 2 FWD will be the primary comm. crew docking location and is already a mess of adapters and such. I think they would prefer to replace PMA-3 at Node 2 Zenith, or am I forgetting something? At either location, I also think it would be easier to just build an IDSS port into the new module and dump the PMA, rather than re-attach it. I am wondering if the new design is large enough to accommodate an astronaut in a space suit. Apart from there being no resources for either Orlan or the US suit, what are the other issues that would make it desperate? If the prime US airlock were to suffer some sort of off-nominal situation, could this be used as a backup? Bishop doesn't have a hatch. In order to "open" the airlock, you close the CBM on station and use SSRMS to maneuver the whole Bishop module to your smallsat deployment attitude or ORU workstation or whatever. To reenter the station, the astronaut would have to crawl inside Bishop and hold real still while it's re-berthed and the CBM is opened. Pirs is available for backup EVA. May be possible to get in and out via Soyuz Orbital Module? I don't know if EMU will fit. Other options would be find a way to spacewalk from a Commercial Crew Vehicle, get an Orion capsule to station, install a hatch in a Cygnus cargo module, refurbish ISS test/spare hardware, etc. Yeah, getting back in might be tough. Soyuz does not have a hatch that can be used for EVA any more, except in the movie "Gravity". Soyuz does not have a hatch that cannot EVA any more, except in the movie "Gravity". You are probably correct that the Soyuz side hatch cannot be operated by EVA astronaut. I was confused: crew have practiced using the Soyuz Orbital Module as an airlock, but entering from Pirs via docking hatch. Then moving Soyuz to another port (or returning to earth). Correct. There is some utility equipment for Orlan in the OM, so the module can be used for internal unpressurized operations. Simple design is great, but that also means no provisions for handling small cargo delivery vehicles, or their cargo. For example, a powered hard stand that can grapple the bell cap and a small delivery vehicle (grabbed by the arm and placed at the hardstand), allowing transfer of an external payload capsule from the delivery vehicle to be stuffed into the bell, which can then be reberthed for final delivery. Simple example might be something like delivering an Intuitive Machines TRV, or an upmass only minimal pressuized cylinder to haul small sized cargos (food, gas/liquids) that are flexible or not dimensionally challenged (which would otherwise require a full sized cargo delivery vehicle). This would essentially create an additional secondary cargo services market ecosystem, which would allow all those smallsat launchers to compete as small cargo delivery launch providers (and provide them with an anchor customer). Hell, the actual payload+service module delivery vehicle set could be made by the smallsat launcher folks or a thirdy party contracting with them. This isn't all that far from a rumored proposal for a small cargo vehicle coming to ISS, getting locked down on the JEM porch, then passing the cargo through the JEM airlock. Would your proposed small items fit through a suit port? In theory, a cargo container delivered by a small vehicle could be grappled by Dextre using a micro square fixture, transferred to an facility on the exterior of ISS, and then transferred into ISS via the Bishop hatch. I generally was picturing JEM airlock max dimension cargo cylinders or the Intuitive Machines TRV. Suitport might work if there's room on the far side to change orientation to fit through the port. Using Dextre seems like an interesting idea for capture, especially the smaller grapple fixture on the arriving vehicle side. The annoyance is the cargo transfer from the vehicle to bishop, as both bishop and the vehiclle more or less have to be next to each other and mounted on something to free the arm for the transfer operation, as it can't hold onto bishop while doing so. Well, unless you somehow use arm+Dextre to grab the vehicle, set it on the hardstand, offload Dextre onto the hardstand, then use the arm to get bishop close to Dextre for the cargo transfer. The final trick is the powered hardstand to hard dock the visiting vehicle and keep it idle powered to keep it warm. Arm reach from capture position to hardstand in one move might be difficult, considering the limited positions to place such a hardstand. I wonder if a PMA could be reused/retrofitted as a hardstand for a visiting small vehicle? Nanoracks already has an External Platform at ISS that may be useful in this regard. Well, that depends on how much must be manually done still, and in the future. If arm+Dextre grapple and cargo ops can be done from the ground and bishop airlock operations can be largely untended, then it reduces to sniffing the airlock for contaminants, opening the CBM hatch, then popping the cargo cannister cap open and transfering goods. If those SPHERES robot balls ever get manipulators, they might be able to even do that from the ground as well. The point of bishop right now is to be an easier to use, somewhat larger cargo airlock compared to the JEM airlock, but that also assumes current crew and current cargo procedures largely (and NASA still allowing crew to do cargo servicing, at low cost). One also cannot discount the possibility that the increasing pace of coresident commercial activities on ISS causing NASA to throw up their hands saying no more, forcing the need of a commercial crew astronaut being added at some point whose primary activities are servicing commercial payloads and cargo, and NASA farmng more internal maintenance activities to the contractor astronaut, ostensibly to allow "science" astronauts to focus on NASA/partner science work (outsourcing in space). One can easily imagine the contractor being asked to stay in the BEAM module. Other possibilities include dragooning short stay space tourists as longshoremen with SPHERES oversight. The long term view is providing a government anchor customer to develop the smallsat launchers and small cargo delivery systems as a marketplace, with the underlying assumption that the ISS experience will create defacto standards for later use on commercial stations/depots/facilities (Bigelow food deliveries, GEO space coral backbones adding limpet-like customers, spiderFAB construction shack materials deliveries). The absolute practicality of small cargo delivery to ISS may be marginal in and of itself, but it informs us about real operations that applies elsewhere. CCdev lit a fire under the larger space industry to provide cargo and crew systems in the absence of the shuttle, but the capsules/technology are still usable for other interests/uses. However, CCdev set the bar somewhat high, keeping most new players out of the game. Can you imagine what it would be like now without CCdev, maybe Orion, and that's it? With a suitable small cargo contract competition (aka microCCdev), all the smaller players can participate. Though that ends up placing a lot of responsibility/burden on Nanoracks to effectively shepard a new secondary marketplace, but to a degree they already dug that hole for themselves arranging cubesat tossing. I expect a lot of mounting locations for CLPA's /MDA's (wedge); Nanoracks refers to them as JCAP (JEM CLPA Adapter Plate), inside the airlock. I also expect that the required crew-time will be minimized, by launching ground assembled packages that can be bolted onto MDA (wedge) interfaces like the Kaber. So the Bishop airlock is really necessary. I expect that an (radiation hardened) E-nose (gas analising tool) will be mounted on the outside of node3, inside the CBM. It can analise the air so the crew doesn't have to do that. Most probably the Bishop will only do about five airlock cycles per year. Will it be stowed at the LEE on the mobile base (MBS), so the payloads can be extracted and deployed or placed with Dextre (SPDM)?